The Moon is a broad-scoped treatment of future lunar development, with a lot of technical information in an easy-to-read style. Outlining the Moon’s historical explorations as well as bold and forward-thinking future concepts, this book is an interesting read for all different types of Earth-bound lunar enthusiasts. The book begins by briefly covering the formation, characteristics, and historical explorations of the Moon starting with Apollo. The authors devote two pages to the three historical theories of lunar formation, including a description of the current collision theory. Next, they describe the scientific and engineering challenges of exploring the Moon. 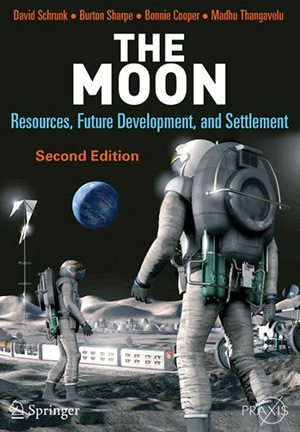 The remaining chapters are future projections with an emphasis on exploration, technology, and development of lunar resources leading to human settlement. The book does not describe the current NASA lunar architecture. Its focus is somewhat farther in the future. Unfamiliar terms are carefully explained, often with good examples. While the chapters do not, in general, cite references, the appendices, which take up more than half of the book’s 520 pages, cite hundreds, and there is a bibliography of source material for the chapters. The appendices cover a range of subjects. Lunar resources and their use are described in one chapter. Next is a long and quite technical treatment of the production of oxygen on the Moon, for human life support and as a rocket propellant. Lunar surface transportation is discussed, from vehicles like the Apollo rovers to light rail and maglev. There is a lot to like. 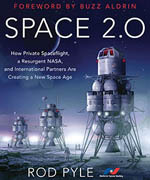 The book has well-described ideas and illustrations for lunar development concepts. The scope includes discussion of robotics technology and its near-term application to lunar operations. Bold future ideas are detailed, such as a solar power grid that wraps all the way around the Moon and thereby generates continuous electric power. The book portrays human operations from an early outpost all the way to cities. The Moon is described as a jumping-off point for exploration of the solar system and eventually, the stars. Human missions to the stars are imagined in terms of “colony ships,” self-contained, fabricated settlements using advanced nuclear propulsion that requires journeys lasting hundreds of years. Speculation in this book is based on known science: no warp drives. Though the book is more readable without the constant distraction of caveats about the difficulty of predicting the future, the writing style gives the impression that all the forecasts in the book are high-confidence predictions and not just speculative ideas of what could happen. An example is the MALEO (Modular Assembly in Low Earth Orbit) approach to setting up an initial human outpost on the Moon. The idea is to assemble the outpost in low Earth orbit (LEO). Its size is described as equal to about three International Space Station pressurized modules. Once assembled in LEO, the outpost is equipped with flight controls, propellant tanks and rocket engines, flown to the Moon and landed all in one piece. The advantage is that the outpost is assembled in LEO, where humans have lots of operational experience, rather than on the Moon, where there is gravity, dust and almost no operational experience. That’s a pretty strong argument for this method. But: 1) the transport and landing vehicle is not a thoroughly tested vehicle with flight history; 2) the cost of failure is high because any loss is a loss of the entire outpost; and 3) if humans can’t assemble an outpost of three modules on the Moon, we can’t expect to do any of the other wonderful things in this book. But that’s an engineer’s criticism. 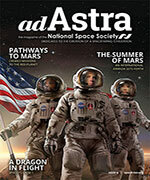 The reader should merely be wary that the main challenge of developing the Moon is doing so at an affordable cost. Gordon Woodcock is a former president, director, and executive vice president of NSS who managed space system preliminary design studies for Boeing in Huntsville prior to his retirement. He has published more than 100 articles on space topics.